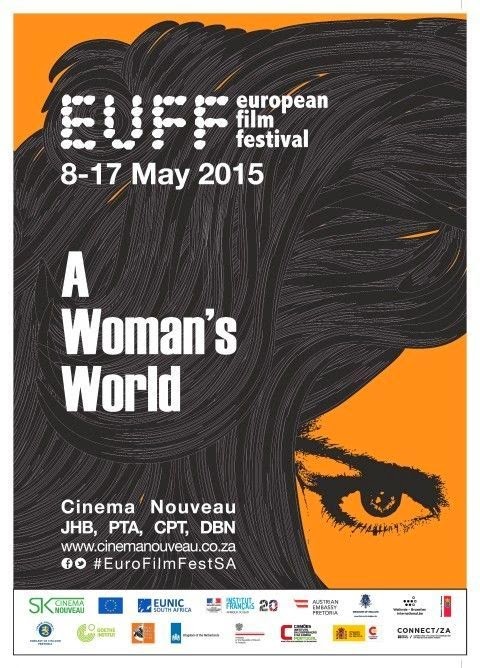 Following the success of the first European Film Festival (EUFF) staged last year, it returns to Cinema Nouveau in May and this year celebrates the role of women in film. The festival’s theme of A Woman’s World is explored in a selection of films that feature female directors, strong female characters or women-related stories. This year’s EUFF features 12 internationally-acclaimed films representing the best of European cinema, with 11 of these being screened for the first time in South Africa. The EUFF is hosted by Cinema Nouveau, co-ordinated by the French Institute of South Africa, and organised in partnership with the European Union and 12 other European cultural agencies or embassies in South Africa: the British Council, the Camões Institute, the Goethe-Institut, the Italian Cultural Institute, the Embassy of Belgium and Wallonie-Bruxelles International, and the Embassies of Austria, Denmark, Finland, the Netherlands, Poland and Spain. All the featured films are the recipients of numerous awards and accolades in their own countries and at international film festivals and competitions, including the Oscars, with the winner of the Best Foreign Language Film for 2015, Ida, as part of the exciting line-up. These are the latest productions from some of the most exciting and talented film directors and actors in Europe at the moment, and a true reflection of Europe’s diverse and creative cinematography. Lola Gallant, brand manager of Cinema Nouveau, is delighted that the EUFF festival has returned to Cinema Nouveau. “We pride ourselves on providing a platform to screen the best foreign language fare, and the 12 films lined up for the EUFF 2015 in May are must-see content". The festival offers a ten-day screening programme that takes place concurrently at Cinema Nouveau theatres in Cape Town (V&A Waterfront), Johannesburg (Rosebank Mall), Pretoria (Brooklyn Mall) and Durban (Gateway) from 8 – 17 May 2015. Bookings are now open. Special festival ticket rates will apply, including the benefits and discounts for members of SK Club, Discovery Vitality and Edgars Club, to make these foreign language films accessible to a wide cinema audience. All the details regarding the festival schedule and bookings can be found on the Cinema Nouveau website (www.cinemanouveau.co.za). Download the Ster-Kinekor App on your smart phone for updates, news and to book from your mobile. For more info, call Ticketline on 0861 MOVIES (668 437).